The Child Labor (Spanish) is a child labor law poster by the Kentucky Labor Cabinet. This poster is mandatory for some employers, including employers of minors. This poster must be posted in a conspicuous place where all employees will see it for employers of minors. This poster describes the work restrictions and break requirements for minors as well as requirements for working during school hours and lists occupations that minors cannot work. It appears you don't have a PDF plugin for this browser. 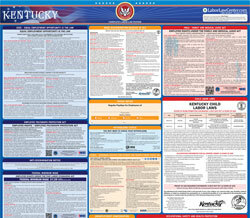 Please see the link below to download kentucky-ky-child-labor-poster-spanish.pdf. n eg o cio s d el e m ple ad or. a lm uerz o .
l a  K RS 1 60 .2 90 .
a lm acen am ie n to s, c o m unic acio nes y  u tilid ad es p ub lic as, y  c o nstr u cc io nes ( in clu yen do d em olic io nes y  r e p ara cio nes). c o m ponen te s e x p lo siv o s.
2 )  Condu cto r d e v eh íc u lo s d e m oto r y  a y u dan te  d e c o nd ucto r.
3 )  Ocu pacio nes e n  m in as d e c arb ón . 4 )  Opera cio nes d e t r o nco s/m ad era s o  a se rra d ero s.
6 )  Exp osic ió n  a  s u sta n cia s r a d io activ as. 7 )  Opera ció n d e a p ara to s d e p od er. p erfo ra d ora s, y  c o rta d ora s.
9 )  Min as, o tr a s q ue n o s e an  d e c arb ón . 1 0)  M ata n za, p ro cesa m ie n to , o  e m pac am ie n to  d e c arn es. 1 1)  O pera ció n d e m aq uin aria s d e h orn o. 1 2)  O pera ció n d e m aq uin aria s d e p ro d ucto s d e p ap el. p ro d ucto s p are cid os. y  t ije ra s d e g u illo tin a.
d e b arc o s.
16)  O pera cio nes d e t e ch os. 1 7)  O pera cio nes d e e x cav acio nes. a l n eg o cio  p rin cip al d el e m ple ad or) . 19)  Cuarto  d e m esa  d e b illa r.